There can be few more idiosyncratic wine labels than Bonny Doon of California. 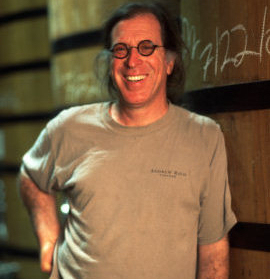 Under the direction of its winemaker, founder, guru and all-round beat-poet and philosopher, Randall Grahm, the Bonny Doon output is obsessively focused on Rhône and Italian varietals, though as you will see here, sometimes follows interesting side roads too. Grahm’s first love was Pinot Noir. In 1981 he planted the Bonny Doon Estate vineyard in the Santa Cruz Mountains, intent on producing the Great American Pinot. Success with the variety proved elusive however, whilst experimental batches of Rhône varieties – Syrah, Roussanne, Marsanne and Viognier- showed significantly more promise in this terroir. In 1986 the first vintage of Le Cigare Volant appeared, an homage to Châteauneuf-du-Pape, that quickly developed a cult following. 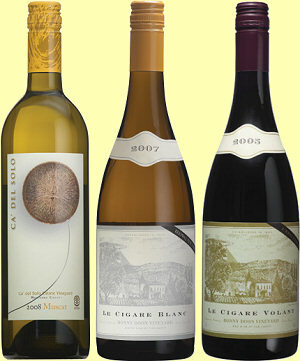 A few years later, the ever-inquisitive Grahm’s newest obsession took hold, in the shape of the great Italian varieties. Soon, a second estate vineyard called Ca’ del Solo in Monterey County was being planted with Italianate varieties including Nebbiolo, Barbera, Pinot Grigio and Dolcetto. More recently, everything from Spain’s Albariño to Portugal’s Loureiro have come to Grahm’s attention and subsequently joined the happy throng. Grahm’s quirky and playful nature imbues every aspect of the Bonny Doon operation, from its information-packed and often amusing back labels and funky website, to the wines themselves. A passionate advocate and early adopter of screwcaps, in 2004 Grahm staged the Great American Corkscrew Recall, an initiative whereby consumers could exchange their corkscrews for a T-shirt, rather like feminists symbolically burning their bras in the ’60s. But his actions are not always so frivolous. In 2004 all of Bonny Doon’s vineyards switched to biodynamic farming practices, in both estate vineyards and those of Bonny Doon’s contract growers, and his back labels carry a full list not only of ingredients, but of each processes and substance used in the winemaking.